I made this from a Linen Guest Towel---really! So here's the thing---I didn't get any sewing done in the last couple of weeks. I was getting ready for and attending the Houston Quilt Festival for the last two weeks, and this week I was playing catch up the whole time. So when faced with a little deadline for this blog, I reached into my arsenal of completed project samples and voila! This one is actually one of my favorite samples---and those cute Christmas-y looking pillows are each made from ONE guest towel! I have taught this project at club meetings a couple of times, so I am simply including a link for you to click and download the instruction sheet for you to have and keep forever. (No selling or sharing! Just give your friend this link to download herself a copy!) 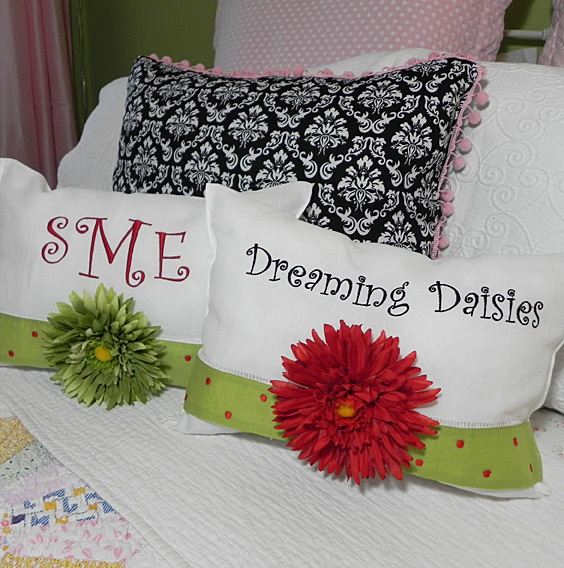 It gives you step-by-step instructions for making the pillow, including how to attach the flower of your choice to the front. One word of warning---we took a shortcut on the outside seams. Instead of turning inside out and doing a "proper" seam up both sides, we just top-stitched the edges together. Because the guest towel is finished along the edges, we could get away with this little "fake-out". It's a great beginning project for the young person in your life interested in learning to sew. For those of you that are sewing purists, you may want to make some subtle changes to the instructions to suit your instincts. Either way, it's a fun project and can be made from any linen guest towel you happen to encounter. I used the Funky Christmas Dot Guest towels, found here. Instructions in pdf form to make this extremely simple project here. I was gone last week and just BARELY got home in time...the leaves have already started coming off the top of the tree, but it's still so beautiful. I really do feel inspired to sew this time of the year, and not just because of the upcoming holidays. How about you?? Hello Susan! It is great to see your project and that tree is really outstanding. You are an inspiration and I appreciate you.